One of the challenges faced by tennis players is the interaction of their shoes with the court. Tennis is played on a range of surfaces with different properties. For example, it it much easier to slide across a clay court than a hard court due to the lower friction with the less rough surface. Researchers at the University of Sheffield investigated tennis shoe-court interactions and subsequently developed a portable mechanical device that can assess the quality of a tennis court which will be utilised by the International Tennis federation. The rubber used to make tennis shoes is viscoelastic which means if a force is briefly applied to the material it is deformed and then returns to its original shape but when a force is applied for longer the material is deformed permanently. The rubber soles are compressed against the surface of a tennis court and the rubber molds its shape to the roughness of the surface which is the cause of the friction. Therefore, when designing the test it was important to understand how load, surface roughness, shoe orientation, temperature and contact area contribute to the frictional force and a lab-based test rig was built for initial tests. The researchers concluded that friction is mainly affected by sole surface temperature and surface roughness, and also the presence of a tread in the shoe sole. In the design of the portable test device, the main features considered were reliability, size and weight for transportation and the ability to represent match play conditions well. Also, the test shoe needed to be interchangeable to allow testing of different sole materials and sizes. The final design consists of a test shoe slider attached to a sled with weights mounted on it, a pneumatic ram which provides a horizontal force to drive the sled. The horizontal force is applied until the test shoe slider is initiated and friction is measured. The researchers hope that with further development the device could become part of a standard test to assess the quality of courts for elite tennis competitions and eventually be used to improve the quality of tennis courts for all players. Article by Naomi Brown; a PhD Student on the EPSRC Polymers, Soft Matter and Colloids CDT programme. For more information, please contact Dr Joe Gaunt at the Polymer Centre. D. Ura, M Carré, Development of a Novel Portable Test Device to Measure the Tribological Behaviour of Shoe Interactions with Tennis Courts, Procedia Engineering, 147, 550-555, 2016. The original material synthesised had an ABA structure comprising of blocks of 2-hydroxypropyl methacrylate (HPMA) and 2-(methacryloyloxy) ethyl phosphorylcholine (MPC).An analogous graft-copolymer has been synthesised where PHPMA chains have been attached onto a PMPC chain via RAFT polymerisation, a form of controlled free-radical polymerisation used frequently by the research group of Professor Steve Armes in the Department of Chemistry. As well as this, AB diblock copolymers of the same monomers have been synthesised and shown to form self-assembled ‘worm-gels’. This novel material is biocompatible and has also been used in this study to determine if it is due to the gel property of polymers with this composition which leads to their antimicrobial properties. Biological assays with staphylococcus aureus have been carried out on all of these PHPMA-PMPC materials to determine more about the mechanism of antimicrobial activity. Results have shown that the ‘worm-gels’, although biocompatible gels, were not antimicrobial. 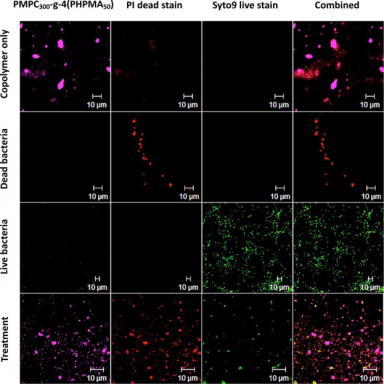 However, the graft copolymer gels have been shown inhibit bacterial growth and further studies by transmission electron microscopy show that this is likely due to the hydrophobic PHPMA chains in the gel penetrating and therefore causing damage to the bacterial membrane. Another interesting property of this graft copolymer gel is its thermoreversible gelation behaviour, making it applicable in the formation of antibacterial smart wound dressings.  Article by Rheanna Perry; a PhD Student on the EPSRC Polymers, Soft Matter and Colloids CDT programme. For more information, please contact Dr Joe Gaunt at the Polymer Centre. (1) Madsen, J.; Armes, S. P.; Bertal, K.; Lomas, H.; MacNeil, S.; Lewis, A. L. Biomacromolecules 2008, 9 (8), 2265–2275. (2) Bertal, K.; Shepherd, J.; Douglas, C. W. I.; Madsen, J.; Morse, A.; Edmondson, S.; Armes, S. P.; Lewis, A.; MacNeil, S. J. Mater. Sci. 2009, 44 (23), 6233–6246. (3) Harvey, A. C.; Madsen, J.; Douglas, C. W. I.; MacNeil, S.; Armes, S. P. Biomacromolecules 2016, 17 (8), 2710–2718. Hydrogels consist of a network of hydrophilic polymer chains held together by cross-links. These cross-links prevent the individual motion of polymer chains leading to the formation of a ‘gel’. Hydrogels closely resemble biological tissues due to their high water content and environmental sensitivities. This makes them attractive for biomedical applications, including tissue engineering and drug delivery. The cross-links between polymer chains can be either physical or chemical. Physically cross-linked gels tend to be weak and the physical cross-links between the polymer chains are reversible. The weak mechanical properties limit the use of physically cross-linked gels in wider applications. Chemically cross-linked gels are formed following a chemical reaction, where a chemical cross-linking agent is added to a solution of polymer chains. By varying the quantity of cross-linking agent, the degree of cross-linking can be altered to optimise the gel properties for different applications. Although chemically cross-linked gels have attractive properties, the toxicity of cross-linking agents limits their use in biomedical applications. Polymer centre academic Dr. Biqiong Chen has attempted to overcome these boundaries by synthesising novel, physically cross-linked, graphene oxide (GO)-gelatin nanocomposite hydrogels by self-assembly. Both gelatin hydrogels and graphene-based materials have previously been studied for applications in drug delivery and tissue engineering. Gelatin is a denatured biopolymer, derived from collagen (found in skin and muscle). It has advantageous properties such as being biocompatible, biodegradable and low cost. GO, the oxidised form of graphene, has low toxicity. Gelatin-functionalised GO nanosheets are non-toxic and can be removed from the body by metabolism. Although these gels are physically cross-linked, multiple hydrogen-bonding and electrostatic interactions between the gelatin chains and GO sheets increase the strength of the 3D network significantly. These gels also exhibit self-healing properties. The GO-gelatin hydrogels are also pH responsive and can be used for pH-sensitive drug release. At acidic pH (pH 1.7) the GO sheets form tightly packed aggregates preventing drug release. At neutral pH (pH 7.4) the pore size increases, promoting the diffusion of an encapsulated drug from the hydrogel to its surrounding liquid environment. This pH-sensitive behaviour would allow selective drug release into the intestine (pH 6.6-7.5) with minimal release in the stomach (pH 1.0-2.5). Conventional drug delivery methods can carry drugs to a specific location but are unable to protect the drug against the acidic and enzymatic environment of the stomach which can lead to the drug being released early or being altered. In contrast, these GO-gelatin hydrogels can protect the drug from enzymatic attack in the stomach. This allows the drug to be maintained and then released in a more controlled manner. This research was published by Dr Biqiong Chen’s research group in the Journal of Polymer Science Part B and was supported by the University of Sheffield. Original Article: Y. Piao, B. Chen, J. Polym. Sci. Part B: Polym. Phys, 2014, 53, 356 -367. Article by Amy Cockram; a PhD Student on the EPSRC Polymers, Soft Matter and Colloids CDT programme. For more information, please contact Dr Joe Gaunt at the Polymer Centre. Rheology is the study of flow and/or deformation of materials under applied forces. Using a plate-plate geometry, where the top and bottom features are flat plates, the measurement of rheological properties such as shear viscosity, normal stress, dynamic modulus and phase angle are enabled. Although this rotational rheology technique is well established, there is continuously growing interest in the combination of rotational rheology with other characterisation techniques to allow simultaneous measurements of viscoelasticity and additional physical properties. Oleksandr Mykhaylyk et al. recently reported a new technique, shear-induced polarised light imaging (SIPLI), which combines rotational rheology with a reflection polariscope in order to study the behaviour of macromolecules and nanoparticles through changes in the birefringence properties of a material. Birefringence occurs when there is shear-induced orientation of particles which creates optical anisotropy. Birefringent materials change the orientation of the polarised light used to illuminate the sample, allowing it to pass through an analyser which is orthogonal to the axis of polarised light. The result of shear-induced orientation is a characteristic Maltese cross pattern. Conversely, non-birefringent samples do not change the orientation of plane-polarised light and thus the resulting polarised light image appears dark. One application for SPILI presented by Mykhaylyk et al., is for the study of thermo-responsive block copolymer micelles. A number of particle morphologies can be produced from the self-assembly of amphiphilic block copolymers in a solvent selective for one of the blocks. These include spheres and vesicles, which form free-flowing liquids, and worms, which form free-standing physical hydrogels. Unlike the non-birefringent nature of the sphere and vesicle morphologies, the uniaxial anisotropy of the worm morphology results in birefringence. Consequently, the thermo-reversible worm-to-sphere transition, and associated reversible de-gelation, of a poly(glycerol monomethacrylate)-block-poly(2-hydroxypropyl methacrylate) hydrogel is an ideal system for SIPLI characterisation. The rheology data presented in the study confirms the expected reduced viscosity on cooling to 5 °C associated with degelation during the worm-to-sphere morphology transition. Simultaneously, a loss of the Maltese cross pattern is observed due the formation of isotropic spherical particles. On heating, the opposite sphere-to-worm transition occurs resulting in the reappearance of the Maltese cross pattern and an increase in viscosity due to regelation. Here, SIPLI has allowed the study of structural-rheological property relationships of thermo-responsive block copolymer micelles. This demonstrates just one application of SIPLI, with many other advantages and applications of SIPLI discussed in the original article. Original Article: Applications of Shear-Induced Polarized Light Imaging (SIPLI) Technique for Mechano-Optical Rheology of Polymers and Soft Matter Materials O. O. Mykhaylyk, N. J. Warren, A. J. Parnell, G. Pfeifer and J. Laeuger, J. Polym. Sci. Part B Polym. Phys., 2016, 1–20. Article by Sarah Byard; a PhD Student on the EPSRC Polymers, Soft Matter and Colloids CDT programme. For more information, please contact Dr Joe Gaunt at the Polymer Centre. Over the last 20 years bubbles and their properties have been of high interest in the field of engineering and have found their way into a variety of applications such as biofuel production, medical imaging, and drug delivery. Lately, there has been a surge of interest in the study of microbubbles which are found in the size range of 1-999μm. The appeal of microbubbles comes from the fact that they possess a high surface area for a given gas volume and therefore enable high levels of mass transfer which is linked with the interfacial area between two phases. Investigation into microbubble formation is essential in order to fully utilise their properties in applications. Many features of bubble formation have previously been explored and have been found to have a large impact, these include pore size and orientation, and flow rate. The university and Polymer centre academic Dr Jonathan Howse et al. present an investigation into how the wettability of the diffuser surface impacts upon the dynamics of bubble formation process. Effects were studied at the orifice as well as upon the resultant bubble cloud produced by the wetting variations. The study comprises a thorough investigation into bubble formation by examining bubbles formed from a single pore, multiple well-defined pores, and sintered diffusers with a random network of pores. Various surfaces were investigated during the course of this study which displayed contact angles from 107.9° to 13.1°. It was found that when a surface displays a contact angle lower than 90° the bubbles that are emitted are significantly smaller than those emitted from a surface with a contact angle above 90°. This data indicates that a contact angle of 90° is a switching point where the bubble size vastly changes. Original article: Influence of Surface Wettability on Microbubble Formation, D. J. Wesley, R. M. Smith, W. B. Zimmerman, J. R. Howse, Langmuir, 2016, 32, 1269-1278. Article by Thomas Neal; a PhD Student on the EPSRC Polymers, Soft Matter and Colloids CDT programme. For more information, please contact Dr Joe Gaunt at the Polymer Centre.